As of 2018, Bodog has advanced their sportsbook and made it available to Indian bettors. With the introduction of Bodog India, bettors from New Delhi to Kolkata to Mumbai can bet on their favorite sports. There’s also a Casino option for when you need a break from wagering on the IPL. What Sports are Available to Bet on at Bodog India? Because this online sportsbook is targeted towards Indian bettors, their focus is on sports that those wagerists love. Cricket: You’ll be hard pressed to find a nation that cares more about cricket than India. Betting options for cricket cover the Indian Premier League, and most international tournaments. There’s also Twenty20, ODI, and more cricket tournaments and games available for your wagering needs. Football: It may be known as soccer to North Americans, but the rest of the world calls it football and it’s available in bulk at this online sportsbook. You can bet on everything from the English Premier League to the UEFA Champions League. There are also odds available for the FIFA World Cup and other big-time football events. Tennis: From the Australian Open to the US Open, you’ll find many tennis wagering options at BodogIndia. If you’re a tennis fan, you’ll be pleased to know that the French Open and Wimbledon also have their fair share of betting options. You can even bet on minor circuits like the ITF and ATP Challenger Tour. You’ll also find MMA, boxing and a racebook for equestrian athletics at this online sportsbook. However, it’s cricket, football and tennis that bettors really go crazy for. There’s also a live betting option that allows you to stream events as they’re happening and place your wagers in-time. Bonuses are what most people look for when they sign up for a new sportsbook. At Bodog India you get a variety of bonuses to choose from. Bodog India provides bettors with a 100% deposit bonus up to Rs. 50,000. Plus, if you deposit Rs. 1000, you are eligible for an extra Rs. 2000. If that’s not enough, Bodog India has deposit bonuses for your first four deposits. When you refer your friends to this online sportsbook, you and your buddy each get Rs. 2000. This offer doesn’t have a limit, so you can refer as many friends as you’d like. The Daily Surprise Bonus can see your bankroll increase from 5-40%. All you have to do is play a maximum of Rs.100,000 worth of games. The only catch is that the bonus disappears within 24 hours, so it’s important to use it as soon as you get it. You can recoup up to 10% of your weekly losses with the Bodog India Cashback Bonus. You have to play at least 10K worth of games during the week to be able to claim this bonus. Nevertheless, if you’re a high roller, it could prove beneficial to recover a small percentage of your losses and put that cashback towards new bets. Is Bodog India the Right Online Sportsbook for Me? 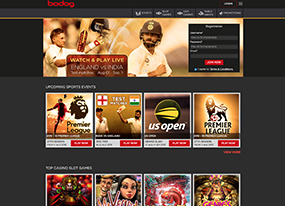 Bodog India may have only launched in 2018 but the brand itself comes with the prestige and trust of an internationally respected product. The Bodog family of sportsbooks and casinos has cemented itself as a secure and reputable brand, second to none. This dependable online sportsbook is open to people from India and other popular Asian markets which makes it easy for those looking to bet on cricket and football to create an account. Moreover, the website is fully optimized for mobile play and perfect for those looking to place their bets from their smart device. If you live in India and are in search of a safe online sportsbook to place your bets, this is the place for you.